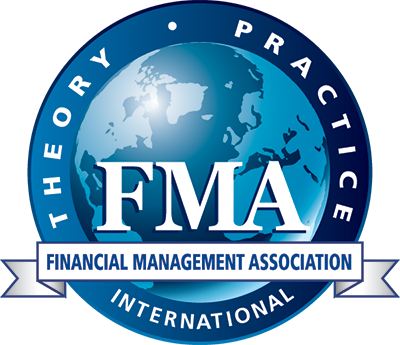 Financial Management Association International (FMA) promotes the development of high-quality research that extends the frontier of financial knowledge by connecting more than 4,000 international finance academicians and practitioners. Dues listed above are for a one-year membership beginning from the date of payment. Dues may not be prorated for partial year memberships. *Sustaining Professional Members help support FMA’s mission through an additional contribution and receive recognition on the website and other publications. Contributions to FMA, a section 501(c)(6) organization, are not tax-deductible as charitable contributions. **A doctoral student joining during his/her first year will receive a free three-year membership. A student joining in his/her second year will receive a free two-year membership. A student joining in his/her third year will receive a free one-year membership. For doctoral students who have completed three years of studies or desire paper copies of publications, the annual fee is only $30 USD (plus postage for locations outside of the US). Click here to join using a PDF form or click here to join online. *** FMA International's Undergraduate & MBA Student dues are separate from FMA local chapter dues. For current undergraduate, graduate and MBA student members who renew their membership and recently graduated may receive two (2) years of complimentary "professional" membership (upon approval). **** Current Professional & Sustaining Professional Members who have retired from full-time employment may notify FMA of his/her retirement to receive an electronic membership for $35 USD annually. Click here to notify FMA of retirement. Contact FMA at 813-974-2084 or [email protected].